The road can be a very strange place sometimes. We come across thousands of people on the asphalt every single day, and sometimes, weird stuff happens. Whether it’s a funny encounter with a fellow driver, a hilarious license plate you can’t possibly wrap your head around, a vehicle or a truck with some very remarkable decorations, a shocking and sudden event, or perhaps even something mysterious–life on the highway never ceases to amaze. 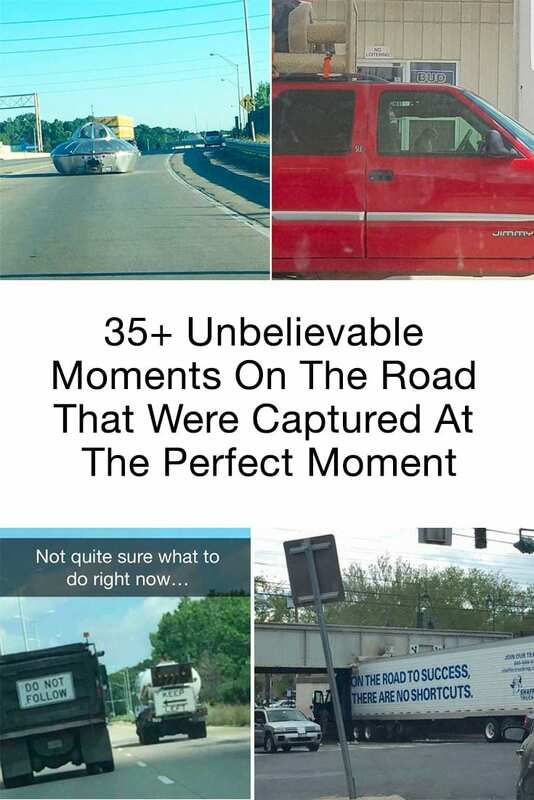 We’ve compiled a list of 55+ incredible moments on the road, which were luckily immortalized on a photo for us to see. “Why did the chicken cross the road?” It’s without a doubt the most common riddle joke in existence. For once, this fine example of anti-humor actually happened. 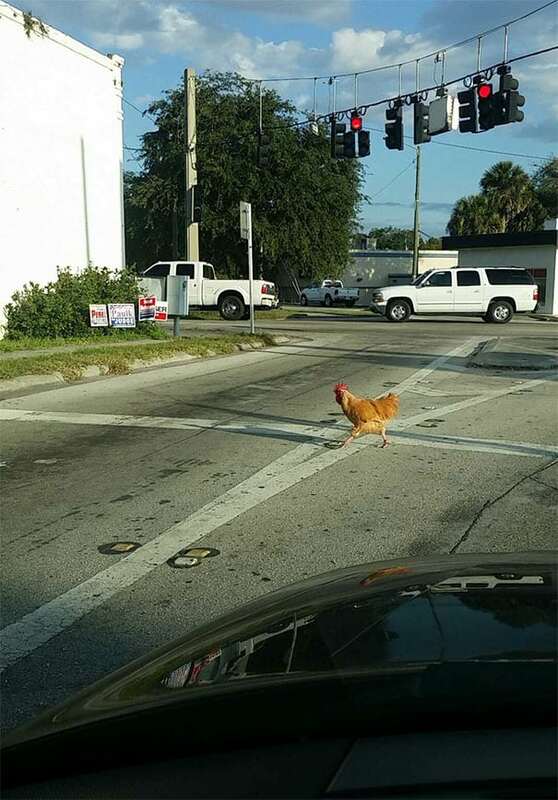 The person who captured this waited so long for this moment, although it does make you wonder – why exactly did this chicken cross the road? At first, your attention might be directed towards the huge feline playset that’s been attached to the top of the car. It looks like a ton of fun for cats, but we’re pretty sure that the cat who’s behind the wheel is having the most fun of all. There’s just something strange about word puns that make you smile every time, even if they’re terrible. 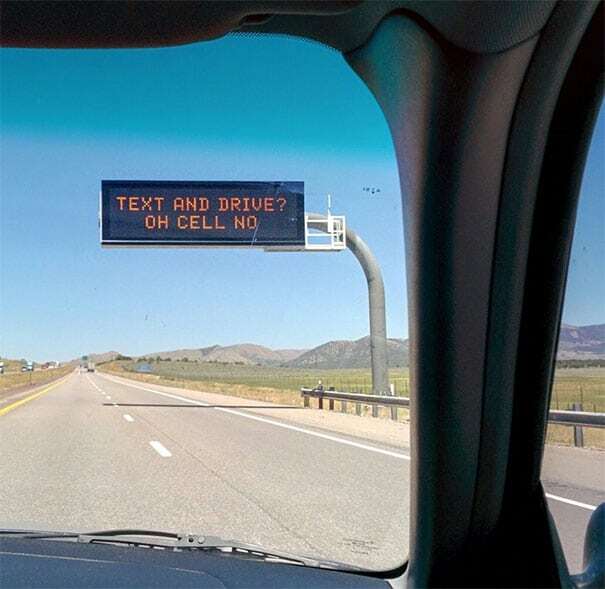 This LED board was spotted in Utah and encourages people not to text or check their phones while driving. Texting behind the wheel? Cell no. “Buddy you’re a boy make a big noise playin’ in the street gonna be a big man some day…” There are just some songs that everybody knows, and Queen’s classic ‘We Will Rock You’ is most certainly one of them. Why not put the text of your favorite song on your truck? 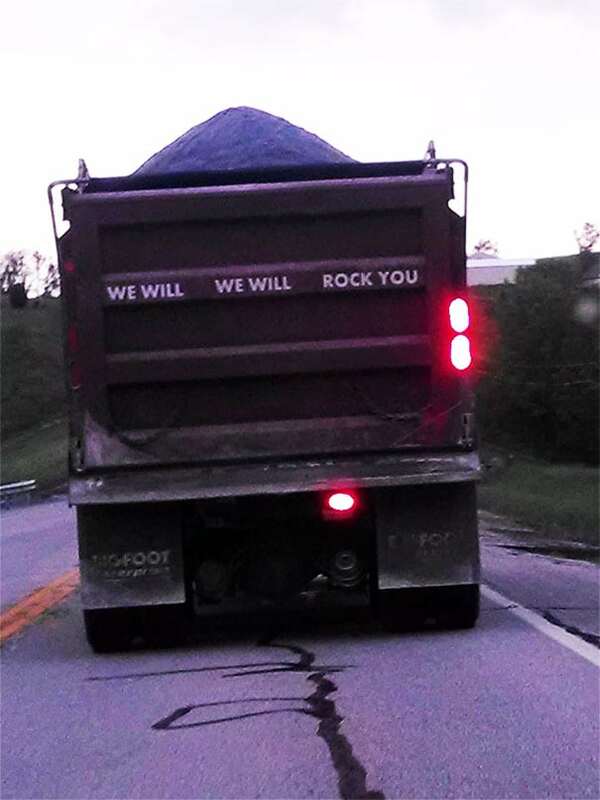 Bonus points if the truck is actually carrying rocks because that would make this Queen reference even better. Who said toys can’t come to life? 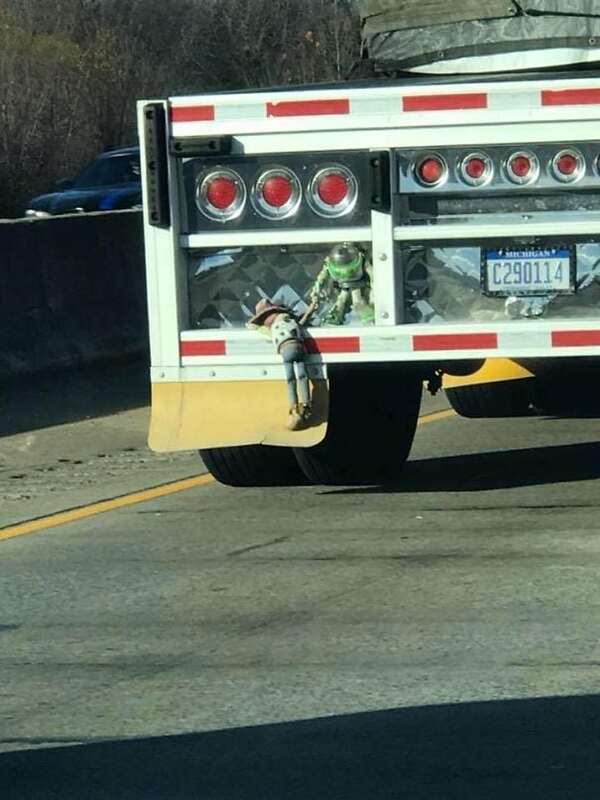 This person managed to snap an amazing picture of the none other than Buzz Lightyear and Woody, the two main characters of the Toy Story movies and together one of the most recognizable duos of all time. Apparently, toys sometimes need a ride too! If there’s one franchise that has been popular for years and probably will still be for a long time to come, it’s Pokémon. 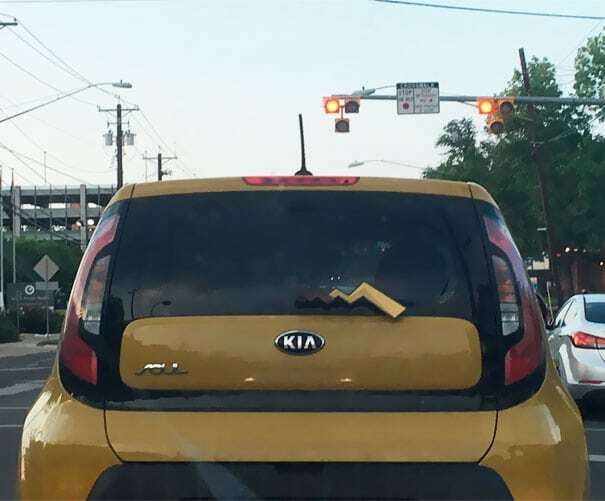 This driver bought a darkish-yellow car, and it turns out that there was only one small adjustment needed to make it resemble none other than the fan favorite character Pikachu. No matter how old you are or what car you drive, nobody is above the law. This adorable little guy was ‘pulled over’ by a police officer and the whole interaction is just too adorable to witness. 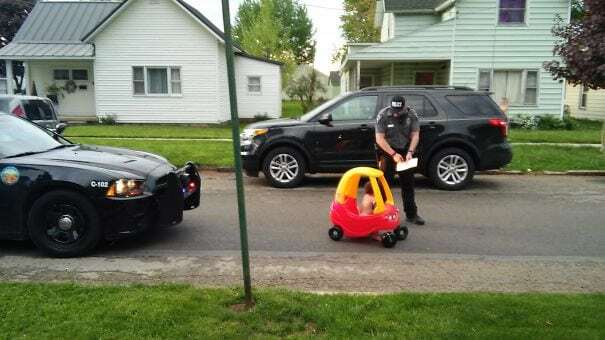 Let’s hope he only got a warning instead of a ticket! Sometimes, you can just look at someone’s body language and immediately notice that they’re having the time of their lives. The person behind this very excited biker probably wishes that he or she could share a bit of that joyful excitement! This woman thought it’d be a good idea to relax and stick her feet out of the car window. Little did she know that a biker riding next to the car had a hilarious idea! 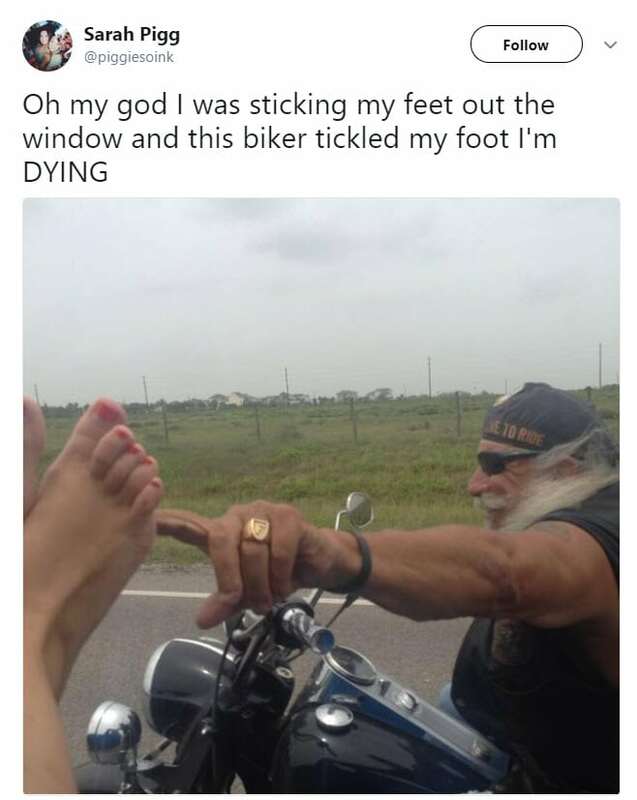 He tickled her foot and the woman quickly managed to grab a picture of it. Her amazing photograph was liked on Twitter by over ten thousand people! Let’s face it – most of us spend a good amount of time on the road and there will be plenty of times when you’re just waiting until traffic clears up. If you don’t have anything to do while waiting, you can always just pop these air bubbles. It doesn’t seem like it makes this driver overly happy, however. Perhaps this person just witnessed an alien invasion on the road? This unidentified driving object – with a license plate, even – was caught hitting the asphalt. It carried two human passengers, but the driver is perhaps the most important and weirdest ‘person’ of them all. Take a look for yourself! There are a couple of texts that you can put on the back of your car that will make people on the road laugh, and this is certainly one of them. 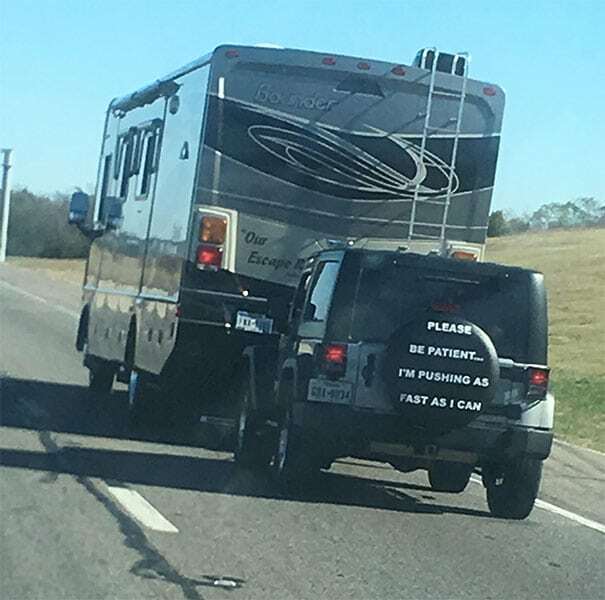 “Please be patient… I’m pushing as fast as I can,” is seen on this jeep’s spare tire holder. What makes it even better in this picture is that it actually looks like the car is pushing the RV! 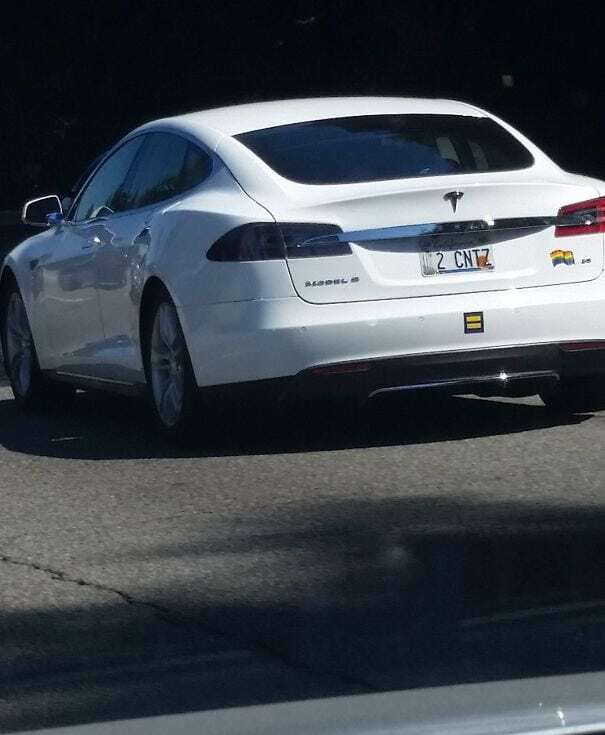 A custom license plate usually costs a hefty amount, but in some cases, that high price tag is most definitely justified. 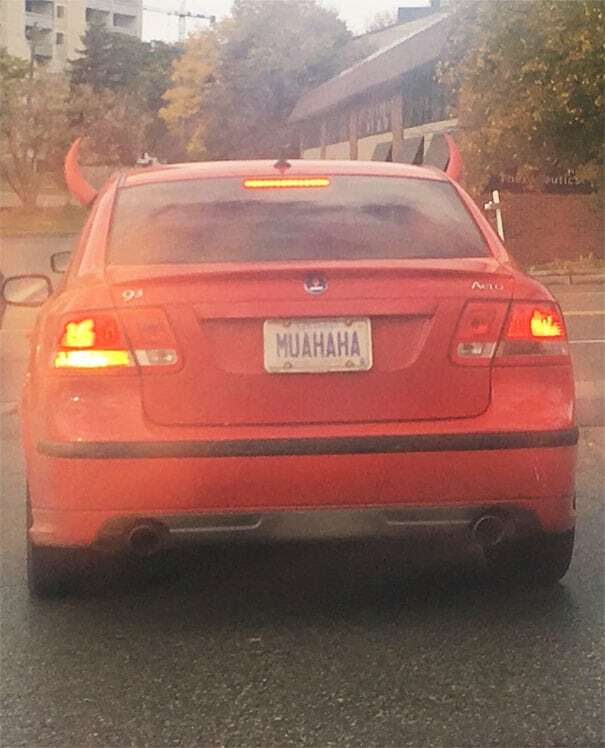 A perfect example is shown in the picture right here, showing a red car completely ‘dressed’ as a devil with suitable ears and the ‘muahaha’ license plate. 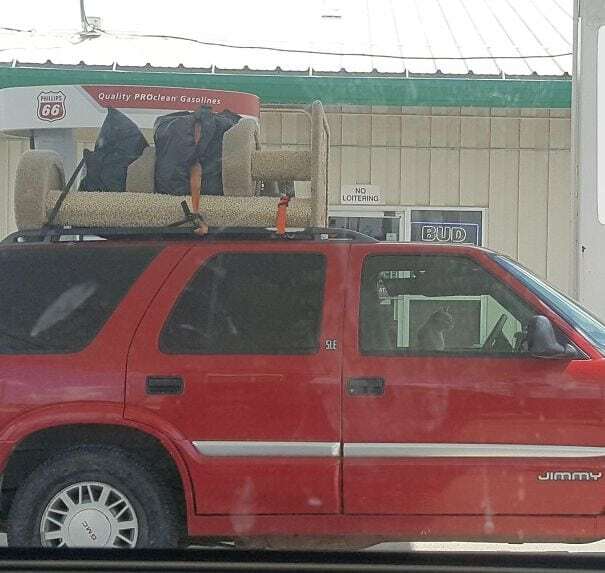 If that doesn’t scare the other drivers, we don’t know what will. This sheriff decided to take the term ‘undercover’ to the next level. 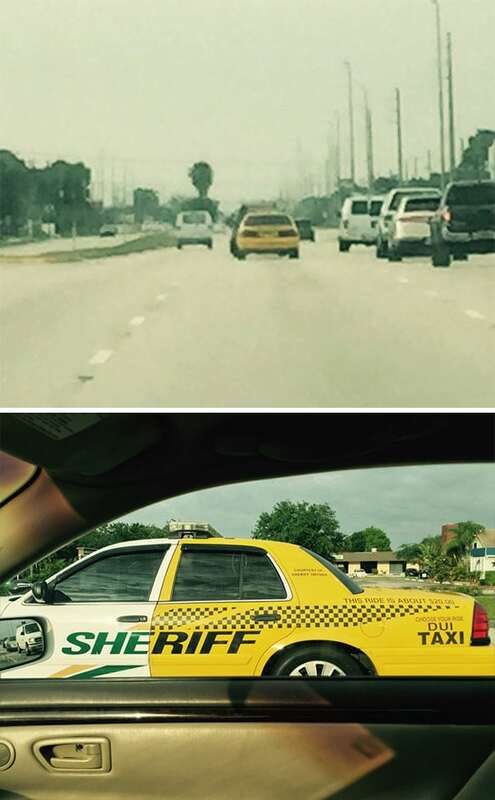 The back side of the car completely resembles a taxi – someone driving behind this car would have no idea that in reality, this car belongs to the sheriff’s department! Sneaky, creative and just brilliant. 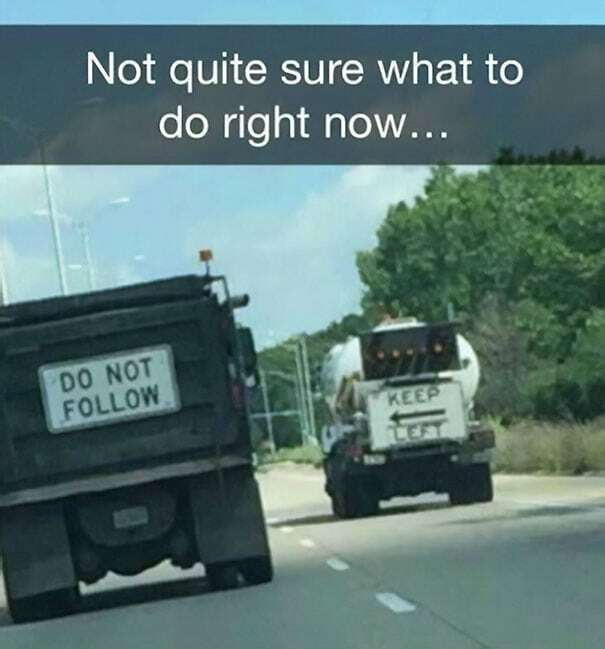 We personally don’t think it would be a great idea to follow his truck’s directions to El Paso, but those directions to the left are probably better than the alternative to the right. 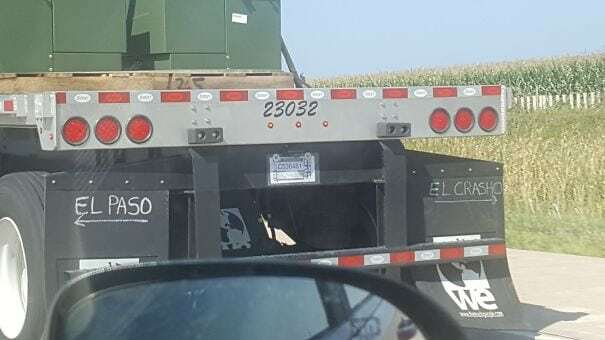 You’d better avoid El Crasho at all costs! The opinion on trucks certainly is divided. They’re extremely efficient at transporting stuff from point A to point B, but you can’t deny that they’re a bit of a pain on the road. 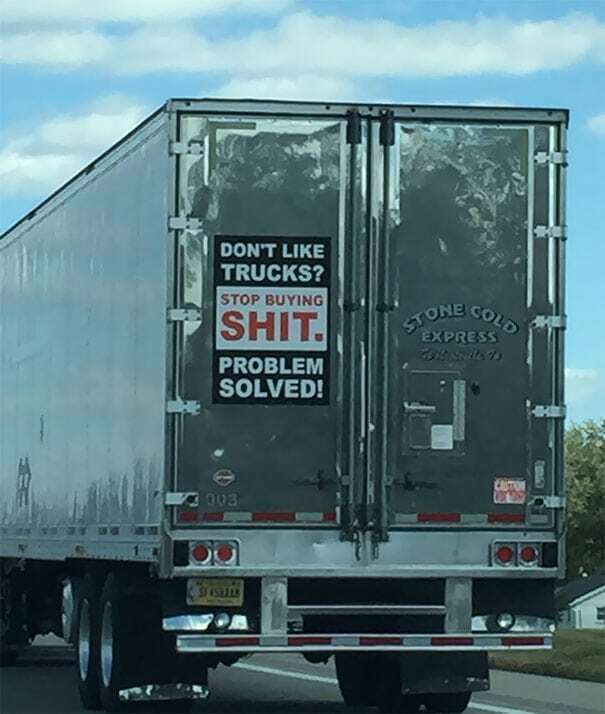 This trucker decided to place a funny sticker on the back, funnily encouraging people to buy less so fewer trucks are needed on the road. Problem solved! Isn’t it just great when you spot some humor where you would least expect it? 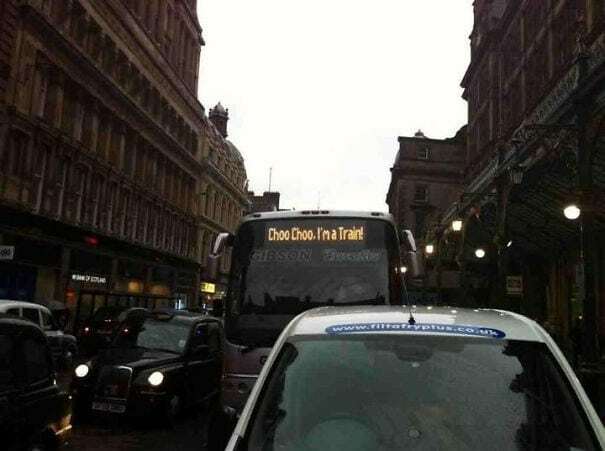 Either it was April Fools or this bus driver was in a very funny mood as the LED-board clearly says “Choo Choo. I’m a train!” Well, it doesn’t always have to be something boring. 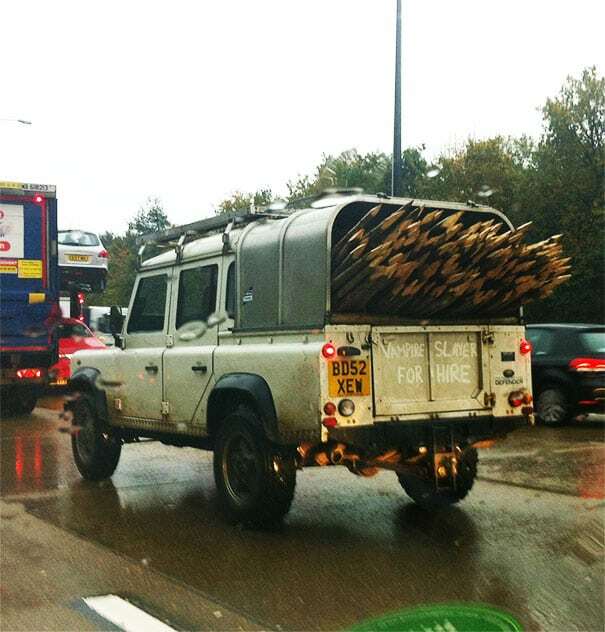 This truck carrying tons of sharp and rather thin logs was spotted on the freeway in the United Kingdom. As if the sharp and toothpick-like logs weren’t unique enough, the text underneath says ‘Vampire Slayer For Hire’. Hey, we all have to pay our bills somehow. A warning triangle is one of those things you wish you never need, but it’s also one of those things that’s required to have in the car. 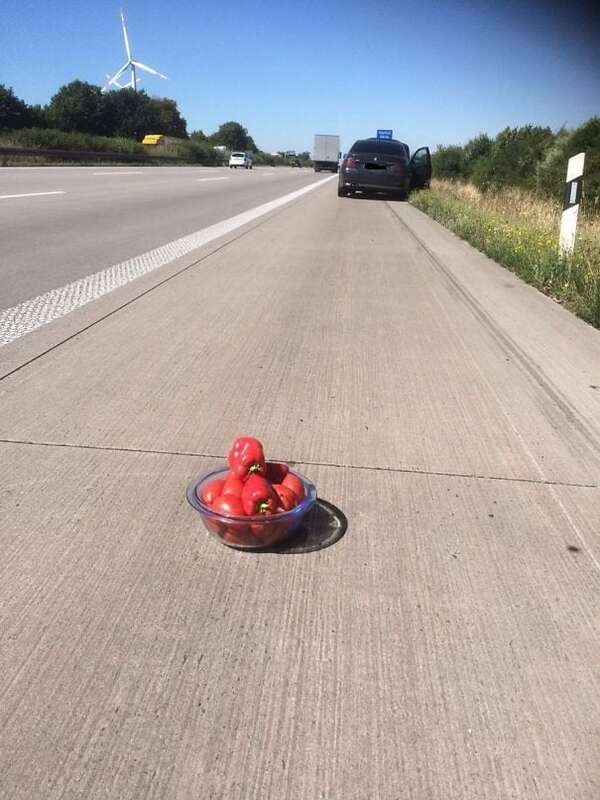 This person from Lithuania didn’t have one lying around, so the driver decided to lay down a bowl filled with red peppers and tomatoes instead. At least they look alike from a distance! The sights you see on the road can definitely be quite unique, and this unique passenger decided to pose for the camera with a very cute helmet. The best thing of all? The helmet had a sticker on it, which read “Bad to the bone.” Can’t argue with that! Roadtripping is the best. After all, it’s not just about your destination, but the journey tends to be at least just as interesting as well. That’s a saying the woman who took this picture can clearly relate to. 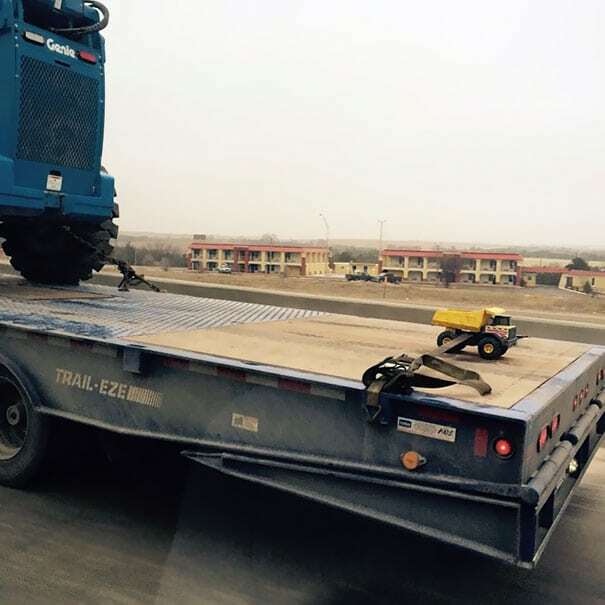 She spotted this very heavily-loaded truck on the road, carrying a smaller sibling. It looks adorable! 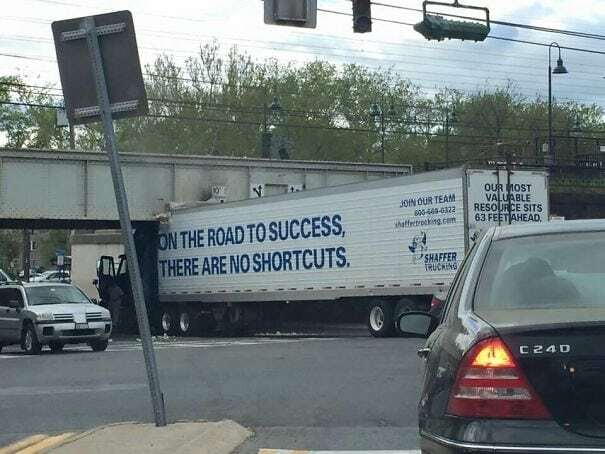 “On the road to success, there are no shortcuts.” That’s a pretty cool and inspiring quote, but apparently, they’re also words to live by. This driver can definitely confirm, who did try to take a shortcut – that didn’t really work out as well. Oh, the irony. Blowing bubbles is one of the most fun things to do when you’re a kid – or when you’re an adult stuck in traffic and getting bored, of course. 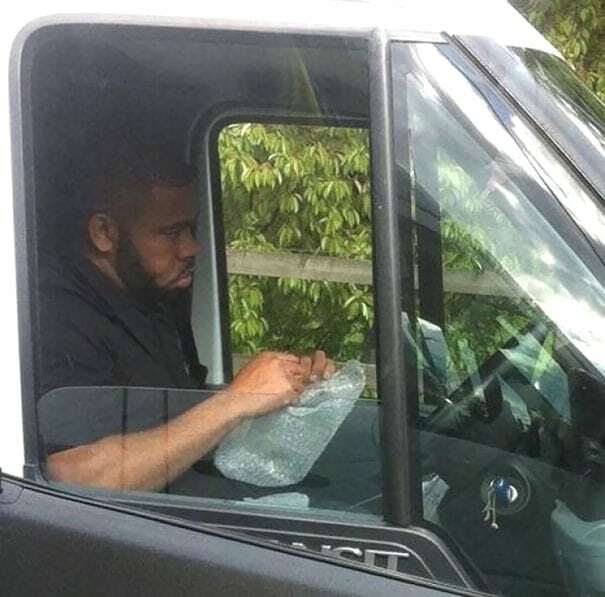 This driver was tired of waiting, so he grabbed some bubble solution and killed some time in one of the most joyful and funny ways you could imagine. If you aren’t convinced that the minions are actually real, you may want to reconsider after seeing this picture. 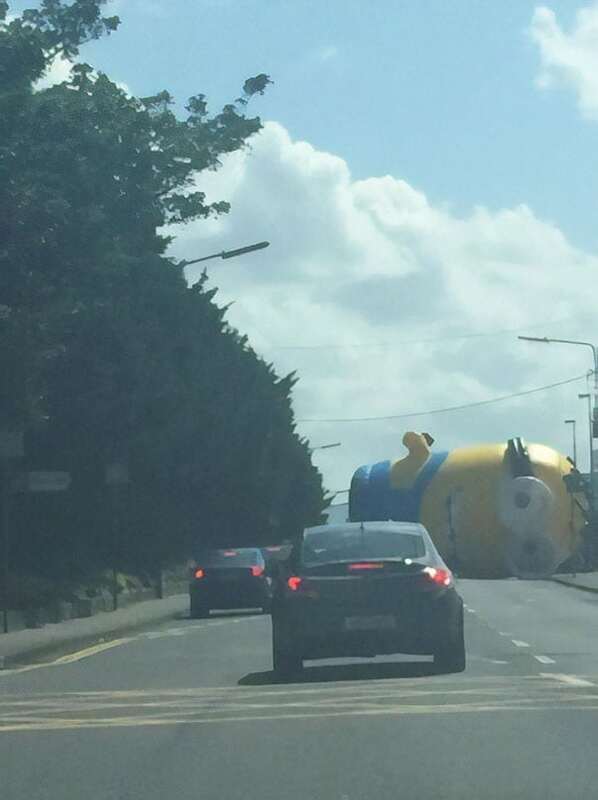 This huge minion decided to lie down in the middle of a road in Dublin, blocking a lot of traffic for a couple of hours. How despicable! Street art is one of those things that is either bland or absolutely awesome. This bridge definitely falls into the latter category. 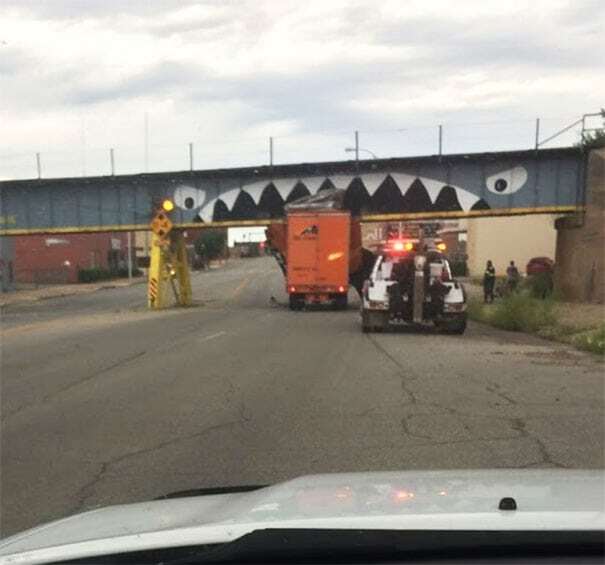 The artist decided to paint an aggressive-looking shark on the bridge, but one truck that was too high must’ve seemingly mistaken it for empty space. Oops! Sometimes, mother nature just needs to do her work, even if that means occupying an entire road. 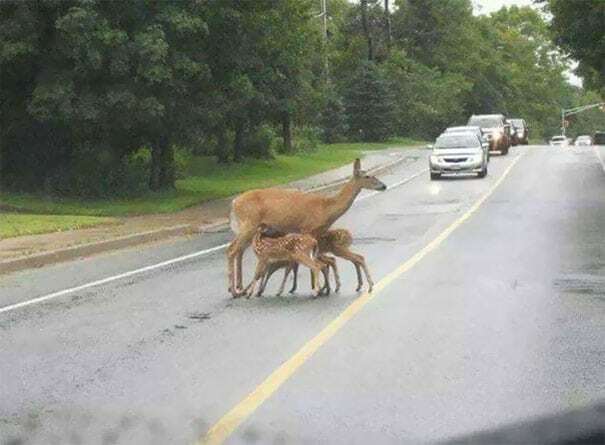 This mother decided it was time to nurse her children in public, although she probably could’ve picked a better spot. Imagine witnessing a situation like this on the road! As long as your car has four wheels and drives well – it’s ready to hit the road. 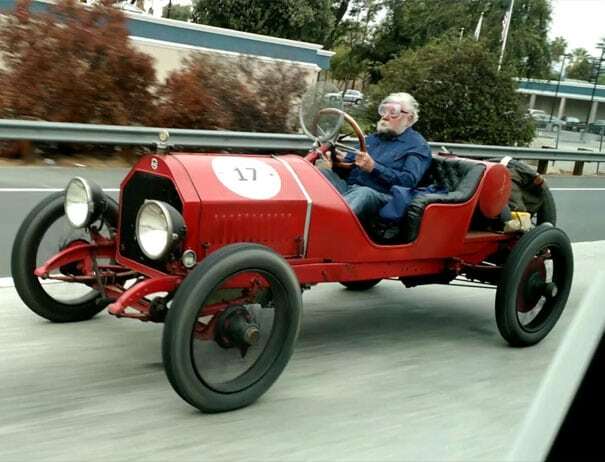 That’s something this awesome driver must’ve thought when he dusted off his exclusive Bearcat vehicle, which released in 1917. This car is over a hundred years old but still looks like new! The adorable ball of energy BB-8 is definitely a contender for the world’s favorite intergalactic Star Wars droid, and this driver is definitely a fan. 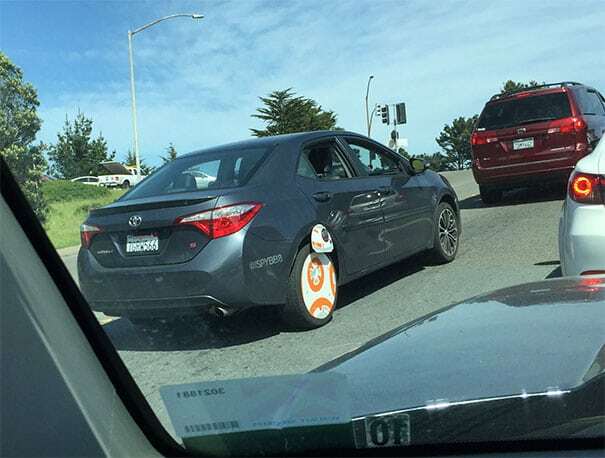 If there’s one thing that resembles BB-8 the most, it’s a car wheel! It almost even looks like the real deal. Sometimes, hacking into things can definitely end up in a funny situation. 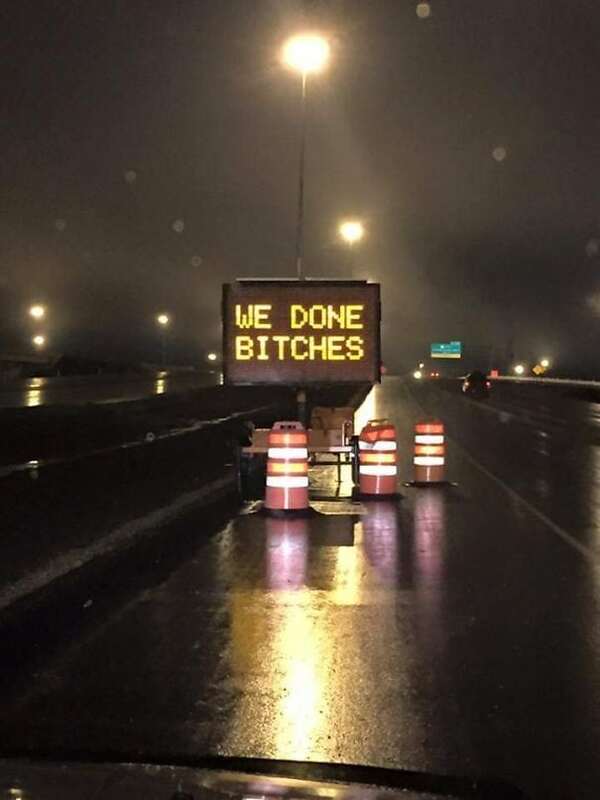 Take this LED board, for example. 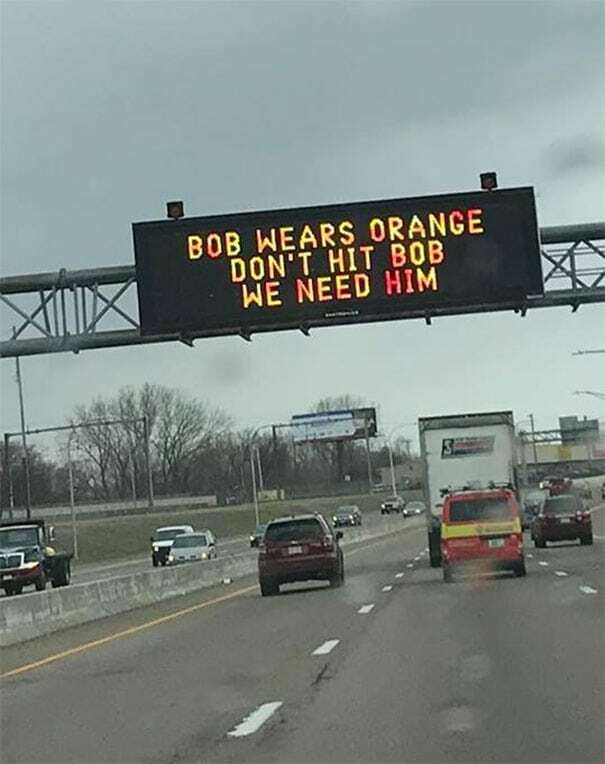 Someone thought it’d be a great idea to honor and protect his or her friend Bob, who clearly wears orange. 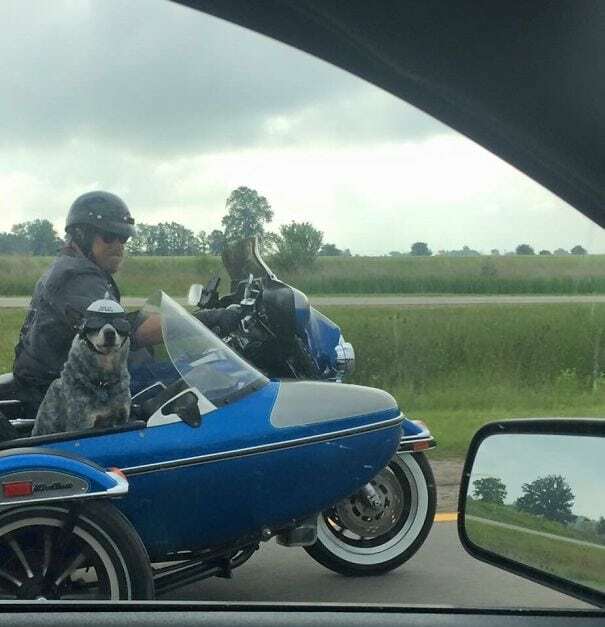 In any case, Bob is going to be much safer on the freeway now! People who are die-hard fans of a certain television show or movie often proudly decorate their car with a well-placed sticker, but some drivers like to take it even one step further. 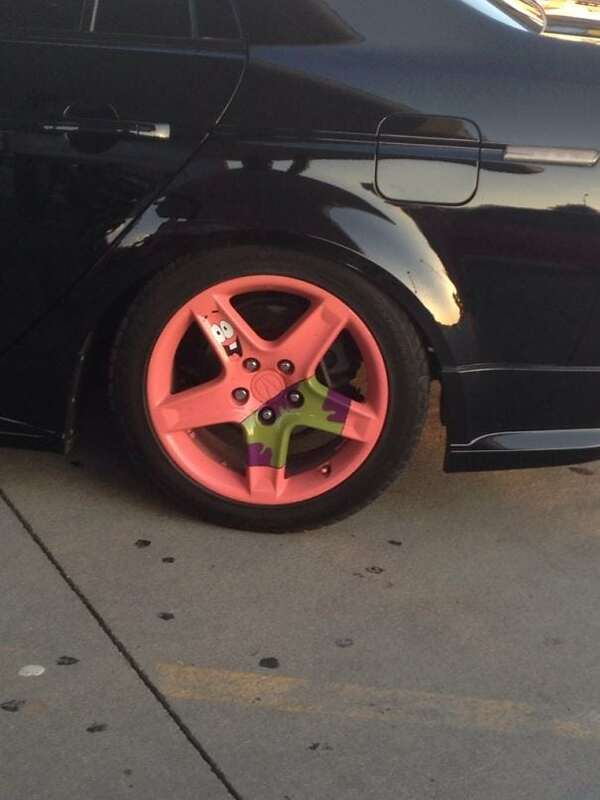 This driver is clearly a big fan of Spongebob, and people can’t seem to decide whether this rim based on the series’ character Patrick is either brilliant or horrible. This artist was definitely inspired by the Looney Tunes classic with Road Runner and Wile E. Coyote. He decided to paint a tunnel on a wall, hoping it would make people think about their speed and awareness on the road. Reportedly, one driver thought it was a real tunnel which resulted in quite a bump, although it was never officially confirmed that the accident occurred because of the street art. Traffic accidents are inevitable, but this driver seems particularly sorry about causing this small incident. Who knows what this dog has been up to all day? 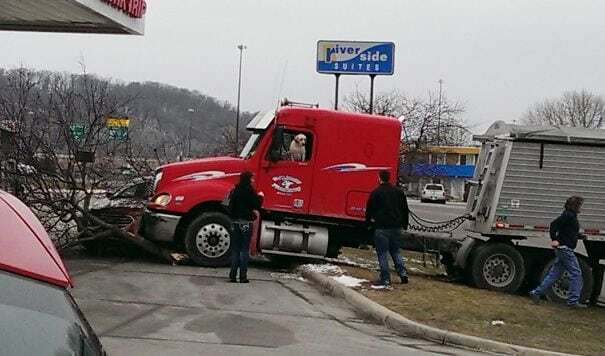 Luckily, this poor pup’s human friends were more than happy to help the canine driver out. His face is just irresistible! If you spot this driver on the road, you’re in for a treat. 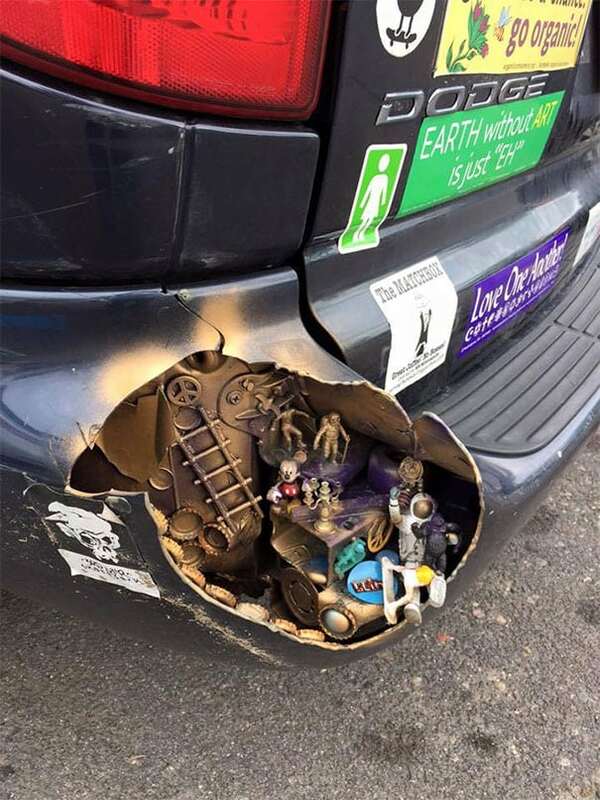 This person decided to make something nice out of a broken part at the back of the car and installed a small and wonderful steampunk-like toyhouse. As the car sticker says, “Earth without art is just ‘eh'”. 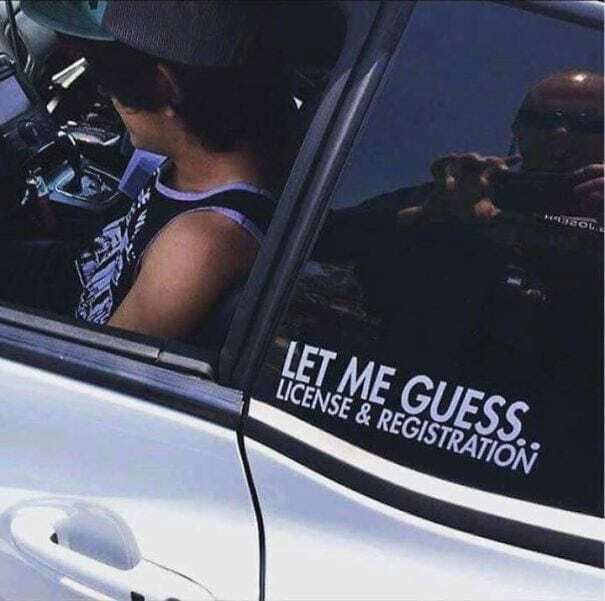 When your car gets pulled over by the police, the number one question that you’ll hear is “license and registration, please.” This driver decided to place a funny sticker on the car window, and just take a look at the reflection to see who’s taking the picture! 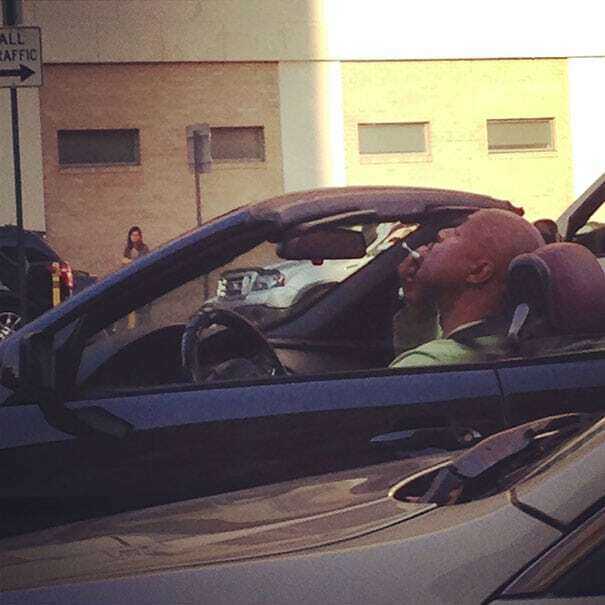 The freedom when you’re driving with a convertible during a sunny summer day is absolutely unmatched, but it can’t exactly be that comfortable in the winter with strong winds and snowfall. This driver clearly didn’t seem to mind the cold, however.